Food It Yourself Garden 2018- so far… | Food It Yourself! Just as predicted by the majority of New Englanders, “springtime” has been bypassed in the north east USA. It is now early summer, even though it is only early May. It happens. We deal with it. 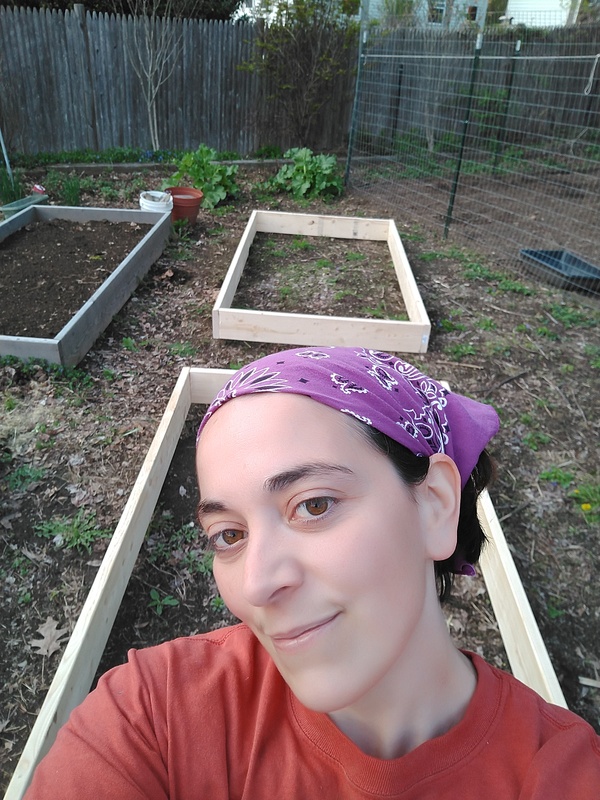 It also happens that I have this week off of work, so I have been getting the Food It Yourself garden together. As noted previously, we needed two more raised beds to get all our desired crops in. So I built them. It was super easy. I bought four boards 2x8x12. I had them each cut (a free service at the local lumber yard) into a 4ft and an 8ft board. Then I made boxes with deck screws. Power tools are a girl’s best friend, after all. Thankfully, I have plenty of loam/compost mix from last year. 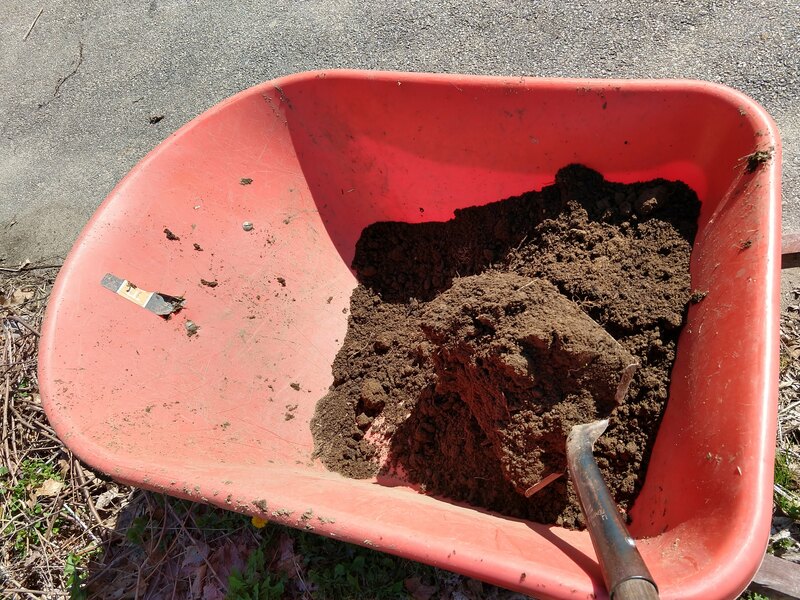 I filled my wheel barrow and rolled it to the Food It Yourself compost pile. 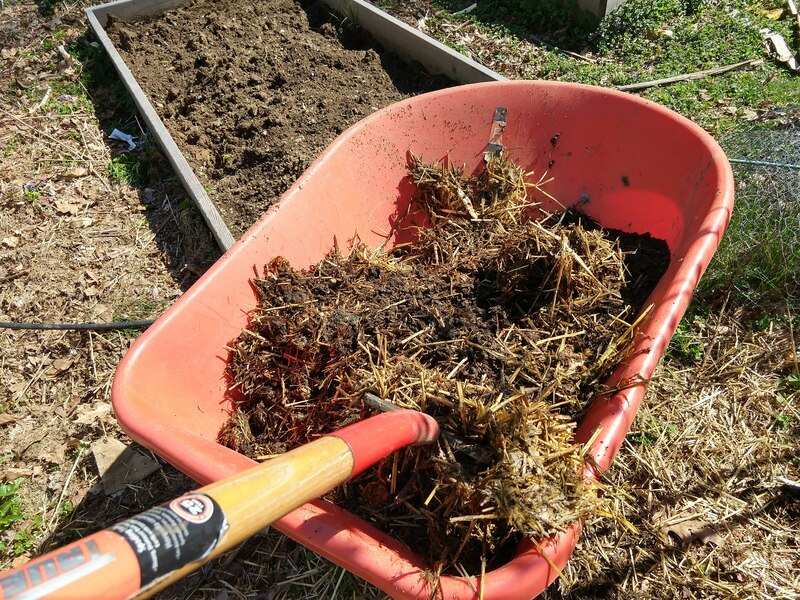 A few pitch forks full of composted coop litter will keep the new raised beds loose, aerated, and fertilized. Three loads did the trick, then it was just a matter of leveling the dirt. The plan was to use these beds for lettuce, peas, cucumbers, carrots and string beans. But how to accomplish that? The answer is companion planting. These veggies all get along in the garden, so I planted them together. Here is where I got all strategic with things. Snap peas produce quickly, then they stop. Cucumbers take a little longer to get going. 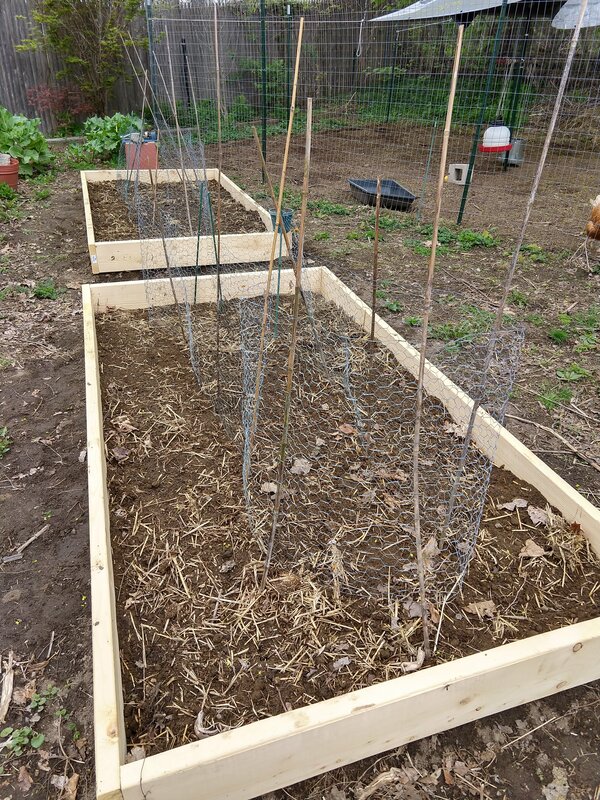 They both could use a little support, like a chicken wire fence.I pulled out some chicken wire fences I made previously and set them up down the middle of each bed. I planted the cucumbers inside the fence loop and the peas outside. By the time the cucumbers need the fence for support the peas will have completed their season. I’ll share more pictures when the sprouts start. 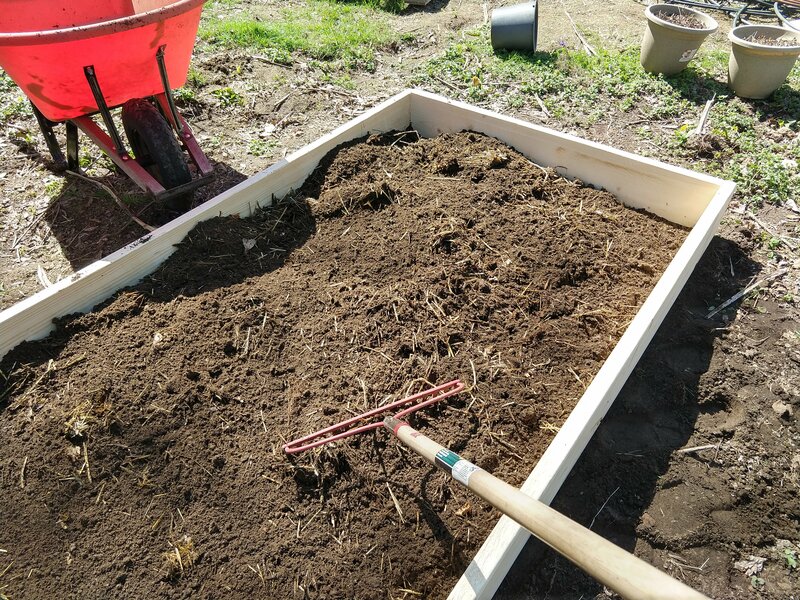 I then planted string beans, lettuce and carrots towards the edges of the boxes. Here is a good tip form planting things with tiny seeds, like lettuce and carrots. 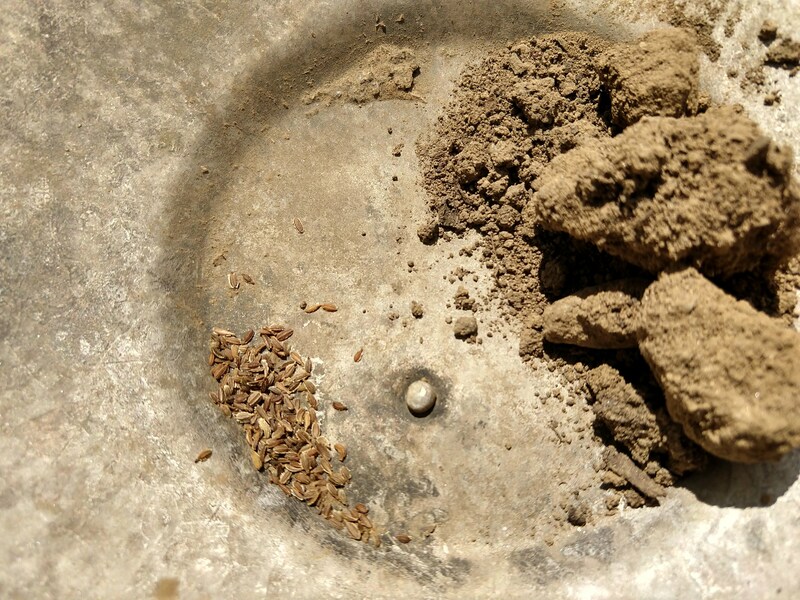 Mix the seeds with fine soil, then sprinkle the seed/soil mix where you want to plant. The seeds will be spaced apart and covered. I wish I remembered where I learned this technique; I’ve had really good luck with it. I am so excited that the 2018 gardening season has officially begun! What are you growing this year? Share in the comments section.